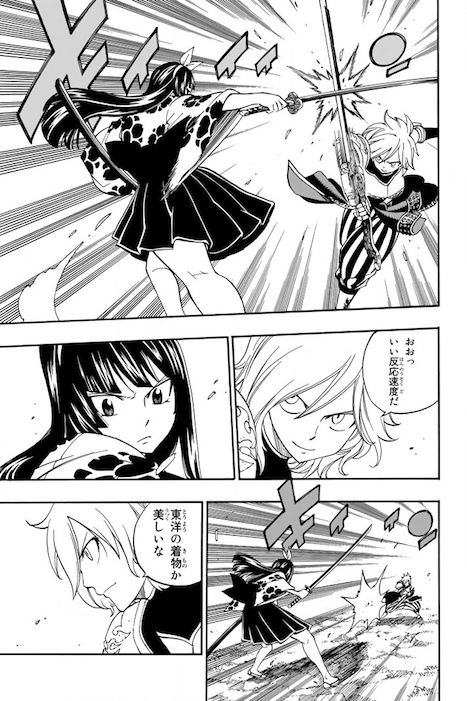 Fairy Tail 467 seems like it’s reached fans sooner than expected. I’d like to start by saying that I don’t quite know how accurate this manga spoiler is, it seems to be legitimate depending on what the images show. Fairy Tail 467 supposedly begins with Marin trying to kill Brandish as she quickly gets saved by the help of Lucy and others in the guild. Marin gets detained and also put in a cell. Both Brandish and Lucy talk about this and how she could potentially be related to her and how she might know about her mother. 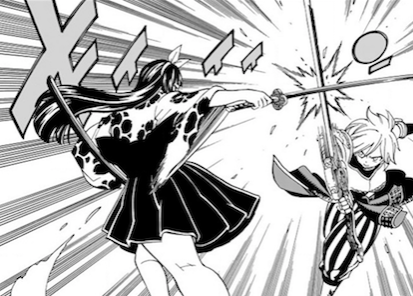 However, Brandish finds the opportunity to attack Lucy, which she does by overpowering her. However, as she does this, some of the water that was nearby in a cup drops on the ground as Lucy is attacked by Brandish. Somehow this water begins to morph and change into something weird but wonderful. 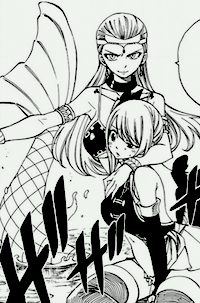 It begins to morph into the one and only, Aquarius, she shows up and saves Lucy from the hands of Brandish. Fairy Tail 467 ends here. There are also two extra images pointing to Lamia Scale fighting against Alvarez soldiers with a large foot as well as Wahl Icht looking towards his enemies and targeting them. These might be extra tidbits to the overall shock that Aquarius is back. Seems like Aquarius has come back, even if it’s without a summoning or a key, she lives within Lucy. And from the above image, it seems like it’s quite possible to be correct. 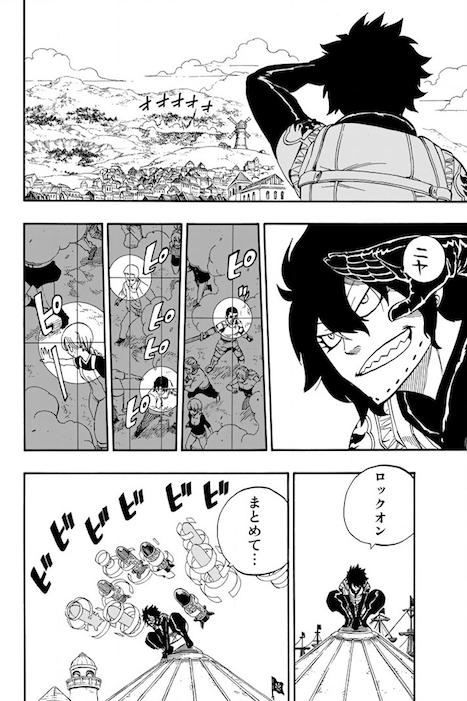 There is also an image pointing to Fairy Tail 468, I can’t read it. Edit: added Kagura vs Dimaria image. Edit 2: Added more Kagura vs Dimaria images, it seems that they both fight, we see that Dimaria wins battle against Kagura. This spoiler was pointed out to me by the user “Brandish” on this blog, Thanks :D, and the above spoiler and image is credited to yonkoproductions. What do you think? Go ahead and tell me what you think about this spoiler! Brandish was saved by the guild. Porlyusica says no need to thank us. Brandish: My name is Brandish μ. My mothers name is Grammy (グラミー), she was a servant to Layla. When Layla retired, she entrusted three keys to her three servants. Capricorn’s key is Zoldeo, Cancer’s key to Spetto and Aquarius to her mother Grammy. My mother respected Layla a lot, Aquarius’ key was so important, she polished it every day. However she was betrayed by her. How did the Aquarius key end up in your hands? Brandish: My mother was the one who received the key, how do you think you got it from your Mama? Brandish: To get the key back, Layla killed my mother. Brandish: That’s why you’re naive. You believe only what you see with your eyes…Now I’ll have my sweet revenge. Aquarius: What did you say about my key? End text: Their mothers’ fates, interwoven. Awesome, thanks for the overview. Could it be that both Lucy and Brandish are sisters. Nop, I think it’s confirmed that Brandish’s mother was a servant of Layla. Kind of a bad idea to mention Aquarius’s name and draw her attention and then try to kill Lucy since Aquarius considers Lucy to be like her little sister. I’ll add them as soon I get a chance.